Once the ideation process is complete and the issues, options, and constraints are set, it’s time to start voting. What comes to mind when you think about voting? For many of us, it’s cramming into a small booth by yourself to fulfill your role as a member of democratic society by checking off a few boxes in total secrecy from your fellow community members. Oh, and you need to do all of this in person, potentially encountering long lines in the process. Ethelo disrupts the entire voting process by allowing voting to be done online in a very detailed and – if the participant wants – open way. Participants can vote directly on issues, or choose other participants they trust to vote on their behalf. They can keep their vote private, or share it with others. An overview of the entire Ethelo process is available in this video. Check out the ideation post if you need a refresher on how we set the stage for the voting. Here, we’ll dive deeper into the two types of voting Ethelo uses and how each can benefit the final decision. Each participant votes by evaluating some or all of the various options. The default way to evaluate an option is to choose a point on the spectrum between “total oppose” and “total support,” but you are by no means limited to those options. One of Ethelo’s unique features is that each participant can identify their own set of criteria or objectives that they wish to apply in evaluating the options. Those criteria can change across options and issues and do not need to be shared with other voters. Returning to the new school example one more time, voters might choose one set of criteria for evaluating the features of a new school and another set of criteria for evaluating its location. A user evaluates each option by assessing, in their opinion, how well the options stand under the application of the various criteria, on a scale of -100 to 100. In this system, “-100” means that the option falls on the negative side of the criteria, “0” means it is neutral, and “100” means the option falls on the positive side of the criteria. Users can choose this value in a variety of ways — a sliding scale, direct entry, or buttons corresponding to different values, just to name a few. 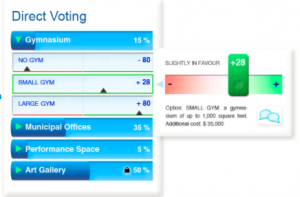 The criteria and voting tool might be different from option to option. For example, one question might be best suited for criteria ranging from “Strongly Disagree” to “Strongly Agree” while “Very Expensive” to “Very Inexpensive” work well for another. The result is a series of ratings for each option referred to in Ethelo as the preliminary score for the options. It would be easy to end voting there and move on to aggregation, but Ethelo takes things one step further to fully harness the power of the democratic process. Rather than stopping at a preliminary score, Ethelo also allows users to weigh in on how important different criteria and issues are to them. Recall that “issues” are groups of options, a quite different idea than “criteria” which are metrics of evaluation. However, both can have weights. Each participant can assign a weight to each issue or criterion on a scale of 0-100. This weight will be used, along with the preliminary score, to generate an overall score for each option. Users can also assign a weight to each issue, on a scale of 0-100 indicating the importance of that Issue to them. So, not only are users deciding how they feel about a given issue, they are also deciding how important that issue and its criteria are in the grand scheme of the decision. This provides participants with an unparalleled level of granularity in expressing their preferences between different scenarios. How all these different components interact may sound complicated on paper, but the process is seamless for users. They navigate Ethelo just as they would any other online survey or feedback tool. The calculations take place behind the scenes in real-time so a user can see how his or her score changes based on how they weight issues and evaluate options. Participants vote “directly” in Ethelo by applying criteria to options and assigning weights as described above. However, they can also vote “indirectly.” We’ve previously written about the concept of liquid democracy and how Ethelo utilizes it to allow its users to build trust networks with other participants based on a person’s knowledge and/or influence in a particular area. Trust networks allow people to distribute their influence to people their trust. By building trust networks, Ethelo can automatically take influence into account throughout the voting process. Each participant can delegate some of his or her influence to others who they trust on certain decisions, issues or criteria. 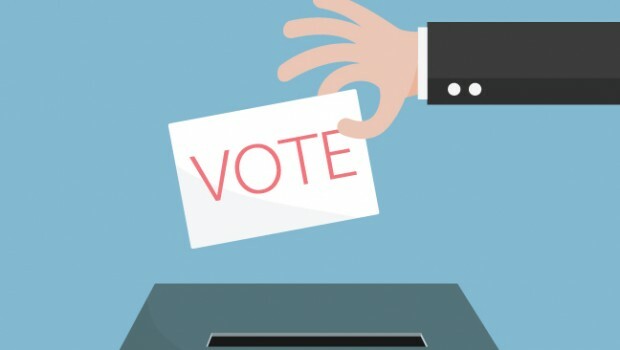 Critics of liquid democracy may see it as excusing participants from applying their intelligence, or giving voters an out for elements of a decision they do not want to engage in. After all, how can someone say they’ve engaged in the democratic process if they give up some of their say to another person? However, this type of delegation is at the heart of representative democracy, and reflects a different, but in many cases equally important kind of social intelligence. Rather than skirting individual responsibility, trust networks harness the true power of the collective and reach conclusions by drawing on shared values and expertise. It is unrealistic to expect any individual user to be an expert in everything, and asking people to do that leads to uninformed decisions that can harm the collective. Ethelo allows participants to engage intelligently in decision-making processes without being experts in the substance of the decision at hand, instead relying on factors such reputation, alignment of values, and shared connections. This influence can be distributed in a very granular way. Participants can specify how much they trust each other’s expertise, not only on decisions but also on the application of criteria and their understanding of issues related to the decision. Democracy often becomes weighed down the idea of fairness — the idea that everyone involved in the democratic process should have equal influence over the outcome of the decision at hand. However, equality is not always fairness. Sometimes, people are affected differently by decisions, or they may have different rights to participate in the decision-making process because of their pre-existing knowledge on an issue. In those cases, it is important to enable non-equal distributions of influence. But in many cases the problem is the opposite; how to ensure influence is distributed equally among participants, and different groups? Ethelo allows influence to be allocated with great granularity, and allows a feedback look where the fairness of outcomes can be measured by how evenly satisfaction will be distributed as a result of the impact of an outcome. Ethelo is able to adjust levels of influence in a given decision process to ensure under-represented groups have similar levels of satisfaction as over-represented groups. For example, if 20 percent of the participants in an Ethelo decision-making process belong to a minority group, but that minority group comprises 30 percent of the overall population, the influence level of members of that minority group can be adjusted by 1.5 times. Along the same lines, the Influence level of other participants can also be adjusted to represent their true prevalence in the population, and the non-representative vote sample can be corrected to show representative results. After the votes are cast and the scores tallied, Ethelo’s algorithm has a chance to shine. The final post in this series will dive into the algorithm to show how Ethelo analyzes votes, trust, and criteria to generate the most popular outcome for any decision.